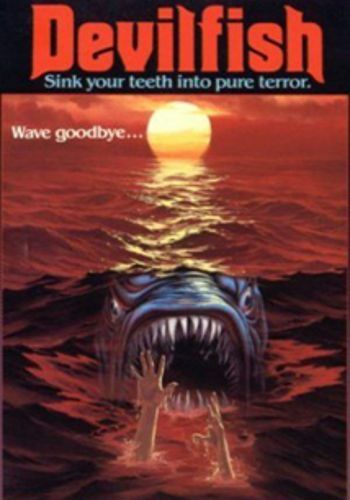 In this moronic genre hybrid, at least seven credited writers -- including Luigi Cozzi, Sergio Martino, and Dardano Sacchetti -- throw Jaws, Piranha, and anything else they can find into a hopeless amalgam of hackneyed story, dull subplots, and terrible effects. Michael Sopkiw and Valentine Monnier are the typically dedicated scientists who try to avert ecological disaster while pawing each other like overheated teenagers. The monster, which is supposed to be a genetically-created hybrid of an octopus and a prehistoric proto-shark (instead resembling a toothy starfish with leprosy), spends most of its time just floating through the water. To compensate for this lack of movement, the victims flail about frantically while pulling the creature's inert tentacles over their bodies. Dr. Davis, the mad scientist behind the "Seakiller Project," gets to babble endlessly while his henchmen run around killing everyone in sight, including a woman who is beaten, stripped naked, and thrown in a bathtub before being electrocuted with a hair dryer. The filmmakers seem to enjoy the sight of women getting beaten up, because all of the female cast members get pummeled at one point or another while wearing very little clothing. Most viewers will find that even the appearance of such Euro-film favorites as Gianni Garko, William Berger, and Dagmar Lassander aren't enough to make this awful mess worth enduring.